The beginner training programme has been designed to lead into the International Field Archery Association (IFAA) system. The IFAA is one of the larger international archery federations. It is generally focused more on recreational archery and caters for a large variety of bow styles in multiple competition formats. For more info on the IFAA check out their website. We focus on the recurve bow disciplines during the beginner programme. Recurve techniques lay a solid foundation for any of the other bow styles. This training programme and syllabus will be applied to all beginner classes and private sessions. Introduction of new concepts & techniques for the module. Challenge/Task - Apply the new concepts and techniques. Practice new concepts & techniques at your current qualifying distance. Extra challenge or extra practice. Official Qualifying session. Scoring rounds. Qualifying will be on the IFAA official targets. Beginners will start on the 65cm Field target face. Ends will consist of 5 (five) shots. 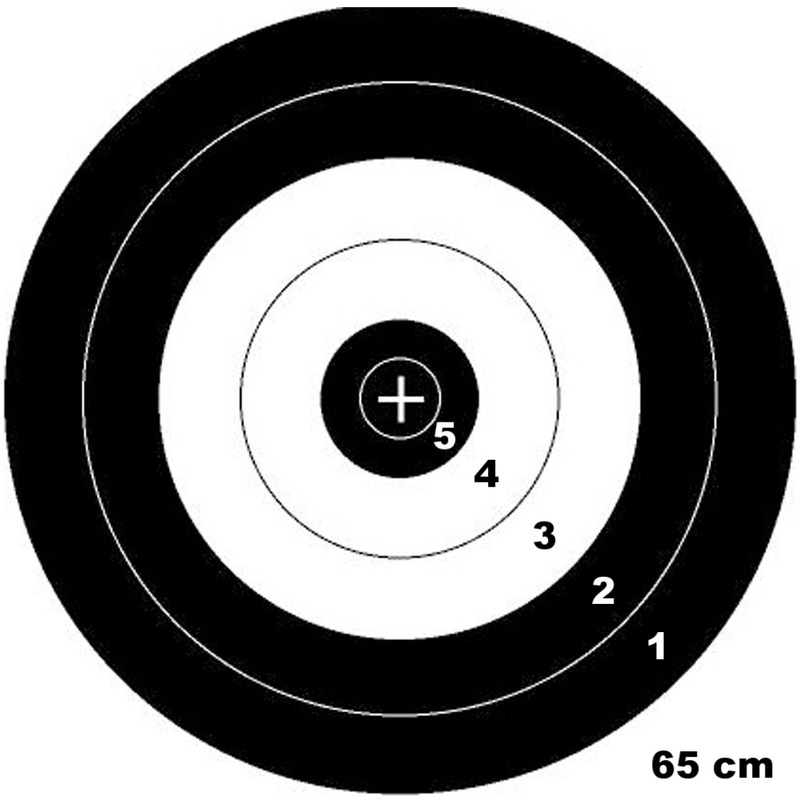 Scoring will be X, 5, 4, 3, 2, 1, 0 as illustrated on the target face below. Line-Cutters: An arrow must break completely through the line in order to gain the higher score. Max score per end = 25 pts. The respective distances and score requirements are outlined in the table below. 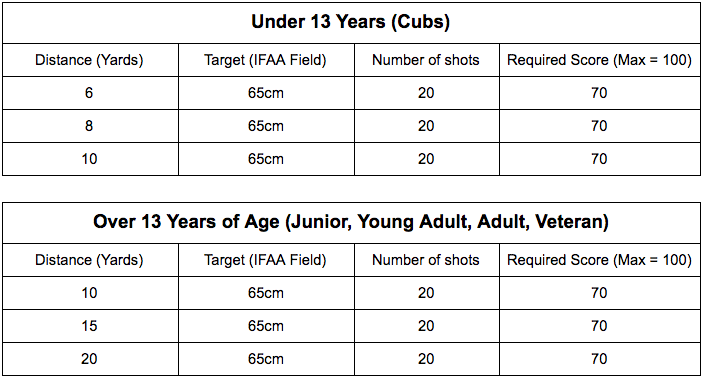 The first three distances of the programme can be achieved with any shooting style. Archers will be expected to qualify using the techniques taught in that month's module. Once the above three levels are reached the target size will be reduced to a 50cm Field target face and the quantity of arrows and score requirement will be increased. Archers will now need to choose the shooting style/s they wish to pursue and qualify accordingly. Our training bows can be set up in either of the 3 main recurve shooting styles; Bowhunter Recurve, Barebow Recurve & Freestyle Recurve. The score only needs to be achieved in one of the shooting styles. Archers will then move into the intermediate programme and onto the official IFAA Indoor Round, which is shot on a 40cm target face with 60 scored arrows. We, unfortunately, cannot cater for this round in the beginner classes. The concepts and techniques of ALL six modules are understood and can be applied effectively. The archer can score effectively and accurately. Safety procedures & protocol is understood and applied correctly. Basic terminology and other theory is understood.